THE HOCKEY SCHTICK: UCLA: Michael Mann Wins Nobel Prize- Again! UCLA: Michael Mann Wins Nobel Prize- Again! 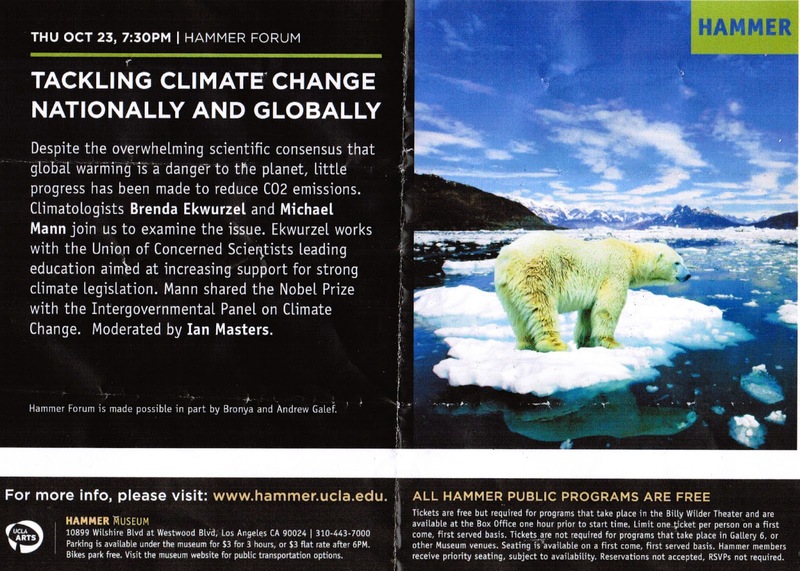 Although the UCLA Hammer Museum quietly corrected it's erroneous internet claim that Michael "Mann shared the Nobel Prize with the Intergovernmental Panel on Climate Change" 10 days before Mann's political propaganda lecture, according to the color-laser-printed brochures that were handed out last week at the UCLA Hammer political propaganda forum on climate change, and which were also available all over the museum, Michael Mann has been re-established as a Nobel Prize winner once again who "shared the Nobel Prize with the Intergovernmental Panel on Climate Change." No doubt, ten days was not sufficient time to correct the error on the color-laser-printed brochures and reprint them. Besides, think of the intergenerational harm to Gaia from all that wasted paper and ink. Love the photoshopped polar bear who doesn't know how to swim standing on the small ice floe and the "Despite the overwhelming scientific consensus that global warming is a danger" garbage at the head of the brochure. I wonder where UCLA obtained the information about Mann's fake Nobel. Could it be from the Mann himself? Or maybe from the back cover of the books Mann was signing in the lobby?